As we draw nearer to the celebration of Jesus’ coming to us as an infant and look to his coming in the last days, we offer our prayers and petitions so that we might be better able to welcome him. For the Church, that during Advent it may be renewed in its commitment to respond to John’s challenge to prepare the way of the Lord and make straight his paths. We pray to the Lord. That the winding roads and rough ways encountered by the people of every nation may be straightened and made smooth through God’s grace, respect for all creation, and inspired world leaders. We pray to the Lord. That John’s proclamation of a baptism of repentance in his time may not be a voice crying out in the desert in our own time that goes unheard and unheeded. We pray to the Lord. That those who live in poverty may find hope and opportunity for a better future during an Advent season of generosity. We pray to the Lord. In thanksgiving for those who gave their lives at Pearl Harbor, and for all the men and women who have sacrificed themselves for the freedom and well-being of our country. We pray to the Lord. That expectant mothers may rejoice with Mary and Elizabeth as they await the birth of their children, and that each may be blessed with a safe delivery. We pray to the Lord. That St. Isabel’s and the parishes of our diocese may celebrate the Advent season with confidence that waiting in joyful hope for the coming of our Lord into our midst will be fulfilled. We pray to the Lord. That Fr. Christopher may know that his season of suffering and waiting draws him closer to Jesus who greatly suffered from injustice but never lost sight of his purpose or of the power of truth. We pray to the Lord. That the sick who anticipate relief from their illnesses as they prepare for Christmas may experience Advent as a season of expectation of Christ coming more fully into their lives. We pray to the Lord. That our loved ones who have died may rejoice forever in the kingdom of heaven where there is no more sadness, no more weeping, no more waiting to be united with the Lord. We pray to the Lord. O God, we know that you have begun good work in us and urge us to complete that work. May the prayers we offer help us to discern what is of value that we may be pure and blameless for the day of Christ and may act at all times for the glory and praise of God. We offer these prayers through Jesus Christ our Lord. Amen. are dropped off at the mall and they walk around the remainder of the day–….they have no family able or willing to care for them..many are not trained for jobs! When I went for a few hours the other night to help my job was to sit at a card table as people came and went to the gym where finner was being served— One man always stopped as he went by and asked if he could bring me a coffee or pop……or could he bring a dessert when he came back…….. I found his kindness to me a blessing —-he was thoughtful and kind–he had a need to do something for someone—–my kindness for him was just a smile and a few words! When I left the church to come home I i had a warm coat and scarf and the wind was blowing (25 degrees ) and i was so cold! But I had a car and a home and family waiting for me to return….A Christmas tree with lights and Christmas music playing—.. it is good to be aware that people there are out there and in need of our smile or time to help on projects like this one at our parish. … Keep those who are homeless in our prayers and charity. We sometimes forget. . We don’t know what caused their homelessness …but we pray and work that they might have a bit of what we have! The people of St Isabel’s along with Fr Senk have good hearts and that is why we loved being there! 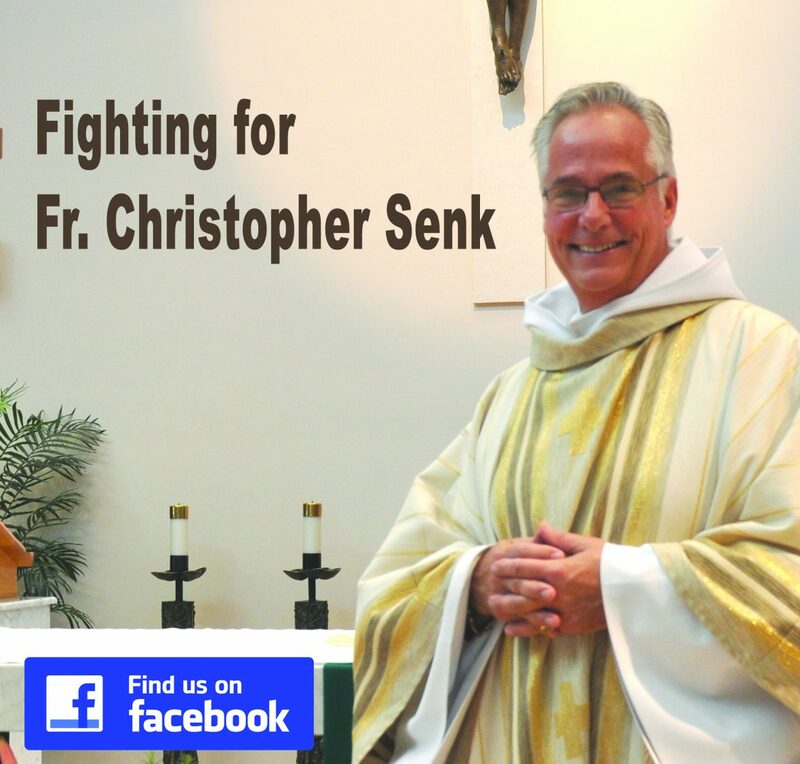 I hope that Father Senk gets back to the parish soon so that he can inspire all of the people again… he did that for us and we want him returned to his full ministry of serving the people! We can only imagine what it is like to be a good priest without his people and his parish. We ask this Advent that he will be returned to his ministry in justice! Come Lord Jesus and help Father Senk get back to where he rightfully belongs!